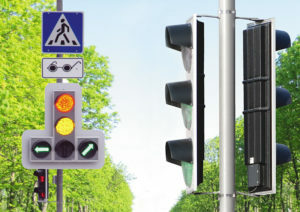 LED traffic lights KOMKON SD are designed to regulate traffic flows. Traffic lights may be controlled by different manufacturers’ traffic controllers. Lighting modules of traffic lights KOMKON SD are made using a set of ultra-bright LEDs, which allows considerable savings on electricity compared with tube lights. Equilibrium spatial diversity of LEDs ensures uniform illumination of the traffic lights panel. Renewed housing has only 120 mm thick and provides durability of construction, light weight, simplicity of assembly and installation. Traffic lights KOMKON SD are implemented in accordance with the effectual requirements of DSTU 4092-2002 and TU U 31.2-32566468-003:2007 (there is a certificate of conformity UkrSEPRO). Photographs of traffic lights KOMKON SD on working objects you can see in the section Gallery. *Keeps operability at voltage 150 – 250 В. **For LED modules with diameter 300 mm. LED lights KOMKON SD is 5 times more energy efficient then lamp traffic lights. The lifetime of LED emitters exceeds the lifespan of traditional lamp emitters more than 50 times. Traffic lights KOMKON SD are made with heatproof and shockproof case. Each emitting module is composed of sections of LEDs, currents in which are virtually independent of each other, which increases the probability of failure-free operation of traffic lights all together. Pedestrian’s traffic lights can be optionally made with time countdown board.